ways to de-clutter, organize, and clear the path! Available for private, campus, and corporate groups. For more information about Regina’s speaking engagements go to Speaking of Clutter. 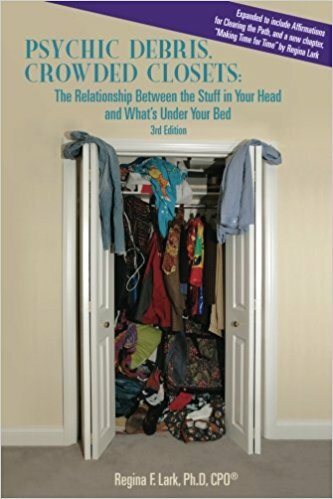 Physic Debris, Crowded Closets: The Relationship between the Stuff in Your Head, and What’s Under Your Bed. Inter Valley Health Plan and Pomona Valley Hospital Medical Center recently had Regina Lark speak to a Women’s Conference in LaVerne, Ca. Her subject was about decluttering your life. Most of the comments received from the over 200 women present were directed to Regina’s presentation: “Loved Regina’s presentation, gave me so many food for thought gems.”, “Enjoyed all the speakers, especially Regina. Would love to hear more from her.”, “Regina came to my house years ago and decluttered my closets. Life changing.” Regina’s topic is most current in today’s more minimalistic world. She brings humor and recommendations that are easy to follow and to achieve success. I recommend her highly. Call 818-400-9592 or email to schedule a workshop or speaking engagement today!